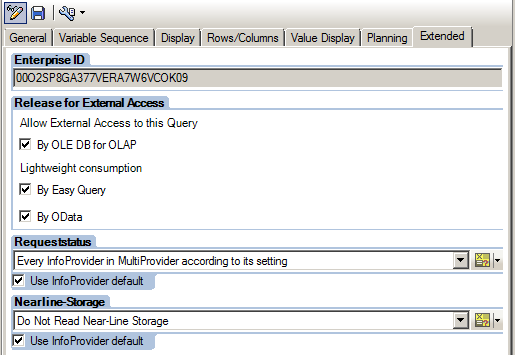 BW queries can be consumed by 3rd party BI tools for long time. This feature needs to be enabled for particular query. To enable it there are settings that are to be done in BEx Query Designer. Furthermore there are even more settings that can be set in the query level with regards to external access to the query’s data. In this blog post I look at these settings. 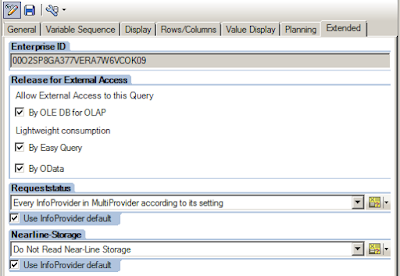 Following flags are available in BEx Query Designer under Properties section of the query and on tab called “Extended”. Both the EQ and OData techniques are focused on so called lightweight consumption. This means that need SAP Gateway to be used. Easy queries can be used also via SOAP or RFC as REST based services. The above two techniques are also part of BW’s Open Analysis Interfaces. This is meat with regards to extraction of the data from source systems and analyzing of the data in BW in various reporting front-end tools. For assigning the HANA external view flag to other SAP BW objects see here. Please note that flag no 1 is available for long time and was introduced in BEx Query Designer 7.x. However for flags 2 and 3 there is a prerequisite to run SAP NetWeaver 7.0 BW Front End for GUI 720.